A white stout that tastes like a dark beer – the unique product of a long and arduous development period. For the project, Borg collaborated with Nørrebro Bryghus to brew two beers; one in Iceland and the other in Denmark. 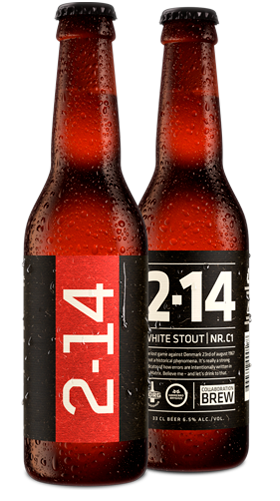 The beers were named after a famous 1967 football match where Iceland lost big against Denmark – the name of the Icelandic version is 2-14, the Danish version: 14-2. This unusual white stout is seasoned with coffee, cocoa nibs, smoked malt, star anis and bourbon vanilla.